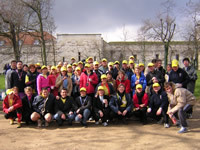 Destiny of a Child took a group of 45 runners from the United Kingdom, France, South Africa, Spain, Belgium and America to participate in the Paris Half Marathon. It was a cold and miserable day and the runners were pelted with hailstones but there was a very warm atmosphere with lots of laughter. The weekend included shopping in some of the finest streets of Paris and dinner in a typical French brasserie.